Topics: Watches, Engagement Rings, Wedding Rings, Jewellery, and Gifts. 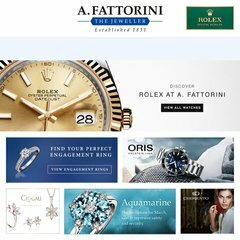 a-fattorini.com WEDDING RINGS - Jewellery - A. Fattorini - Jeweller in Harrogate ..
a-fattorini.com ENGAGEMENT RINGS - Jewellery - A. Fattorini - Jeweller in ..
oris.ch Oris - Purely mechanical Swiss watches. It is hosted by Popcorn Hosting Ltd Dedicated Servers (Northern Ireland, Belfast,) using Apache/2 web server. The programming language environment is PHP/5.3.18. Its 2 nameservers are ns1.popcorndns.net, and ns2.popcorndns.net. PING (84.18.195.155) 56(84) bytes of data.